"As soon as my husband and I started working on the adoption plan, we wanted to find out about breastfeeding -- Was it possible? What does it look like? It was such an important part of my experience with my older children and I wanted to provide that for our adopted baby, too." 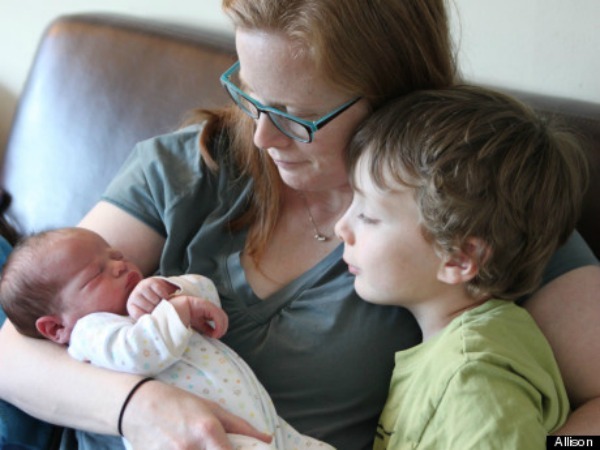 These are the surprising opening words of a post that Allison, a 40-year-old mother to a 6-year-old, a 2-year-old and a newborn adopted son, has written for The Huffington Post&apos;s "Breastfeeding Chronicles" series. Why did she want to do it so badly? "I wanted him to feel that bond - that closeness and skin-to-skin, to help him feel comforted," she explains. "Not being pregnant, and not knowing what he felt like in the womb beforehand ... I wanted that physical connection with him afterward." It&apos;s a concept that I&apos;d never even considered possible. Breastfeeding my biological children felt like such a struggle at times, I can&apos;t even begin to imagine how tough it would be to convince your body to breastfeed when you hadn&apos;t gone through childbirth. But Allison proves it&apos;s possible. She explains: "I went on medication about four months before our youngest son was born, and started pumping six weeks before his birth in order to get ready to breastfeed him. There are a few different variations of lactation induction depending on how much time you have before the baby is born. I followed the accelerated protocol. "I took a combination of the birth control pill -- which has hormones that are intended to mimic pregnancy -- and another medication that is actually not approved by the FDA for this specific use in the U.S., but that is used in the EU and Canada. It&apos;s called domperidone, and it causes your body to start to release prolactin -- a hormone that helps make breast milk." Allison admits her doctor was "so leery" about the concept that she switched to another physician who happily prescribed the hormone. That was the easy part. What followed was a regime of breast-pumping every three hours for the six weeks before her adopted son arrived. "For the first week, I made literally drops," she recalls. "But slowly, I was able to increase that to about 5 ounces each day. That&apos;s a little bit more milk than is typical, and probably had to do with the fact that I just stopped breastfeeding my middle child a year before." Allison was lucky enough to be in the delivery room when her son was born. "Within the first hour, I was able to breastfeed him, and I stayed with him and breastfed him every time he woke just like any normal mum would. I was only the second person they&apos;d encountered at the hospital who&apos;d ever done this, so everyone was asking questions -- What are you doing? How did you prepare? They were very concerned about whether he was getting enough food, so they kept weighing him, but he was fine." She admits she soon couldn&apos;t produce enough milk to support his needs, so she supplements with donor milk. And there have been moments of trying to get him to latch where she&apos;s been tempted to throw in the towel. "But I feel so bonded and attached to him, and I think a huge part of that has been the breastfeeding."